It's a dark and lonely Christmas Eve in the dining room of ancient Soul's College. The kitchen boy, 11-year-old Lewis, has helped prepare a highly unusual meal, made with unrecognisable ingredients, cooked by a mysterious chef. And then the guests arrive ... and carnage ensues. They are ex-students of Soul's College, and they are all completely demented. They demand bottle after bottle of wine, flinging their cutlery and howling like banshees until ... silence. The Dean of Soul's College has arrived, and the evening's ceremonies must begin. For this is the annual meeting of a secret club for those who despise children, warmth, happiness, and above all Christmas. Each member must try to outdo the others by telling the most terrible, disgusting story they know. 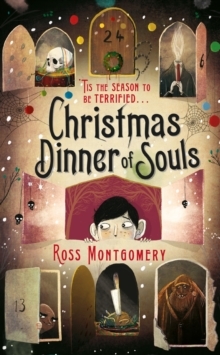 A spooky, shocking, bloodthirsty alternative to festive cheer that will appeal to, fascinate and delight young readers.